It all begins when a young authoress, Juliet Ashton, starts a correspondence with Dawsey Adams, a member of The Guernsey Literary and Potato Peel Pie Society – all because of a book he found with her name on it. As the correspondence goes on he shares his and the other members’ experiences of a Nazi-Occupied Guernsey. Juliet is moved by the stories and decides to visit the island and write about them. The Guernsey Literary and Potato Peel Pie Society is a historical novel by Mary Ann Shaffer and Annie Barrows that was published in 2008. The novel is set in 1946 and is an epistolary novel just like Lady Susan by our dear Jane Austen. I just cannot resist this kind of novel. It has something magical about it. So you tag along Juliet and fall in love with each of the Islanders; Dawsey, Amelia, Isola, Eben, Kit, and Elizabeth. The war is over but they still meet to discuss books and share their lives that are so intertwined with love and loss, it becomes all one big and beautiful story. Trouble is… they don’t want a book about them. If you want to know why you just have to watch it. I promise you won’t regret it. The one that started it all is Elizabeth McKenna – played by the adorable Jessica Brown Findlay. Another Downton Abbey star graces this movie – Penelope Wilton – our famous (or infamous?) Mrs. Crawley. If you think Eben looks familiar you might have seen him in Dickens’s Little Dorrit (in a BBC adaptation) as the protagonist’s father. Isola, I mean, Katherine Parkinson, is the super funny (and clueless) boss lady in the hilarious “The IT Crowd”. Do you need another reason to watch? Say the name Dawsey out loud. Does it remind you of a beloved Jane Austen character? Yep. It sounds like Darcy. Juliet Ashton is played by Lily James who is known to us – fans of period drama – for Downton Abbey as Lady Rose MacClare and also as Elizabeth Bennet in the movie Pride, Prejudice & Zombies. There is more! Matthew Goode – always a good reason to watch a movie. He plays Juliet’s editor and mentor. Awww… so adorable as a nerd. Most Janeites should remember him from “Death Comes to Pemberley” where he played the most handsome George Wickham. Part Two Sunday, November 2, 2014 at 9-10:30pm on PBS A suspect goes on trial for his life, while Elizabeth pursues the real truth behind a mysterious death. The future of Darcy’s sister Georgiana also hangs in the balance. Shown: Matthew Goode as Wickham (C) Robert Viglasky/Origin Pictures 2013 for MASTERPIECE This image may be used only in the direct promotion of MASTERPIECE. No other rights are granted. All rights are reserved. Editorial use only. Do you need any more reasons to watch this beautiful movie? Convinced yet? 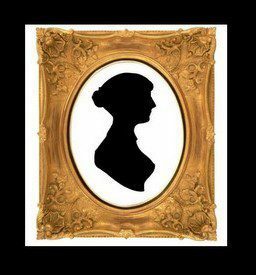 If you have already seen this movie please leave a comment and let me know if you found more Jane Austen related trivia. Call me silly but I love to find any tidbits that form this wonderful world of Jane. Let me know if this post was the first time you heard about this movie. If so, I hope you enjoy it as much as I did. loved the book and also the movie…All the actors fit the parts. Glad they left out some of the later part the book and changed the ending.